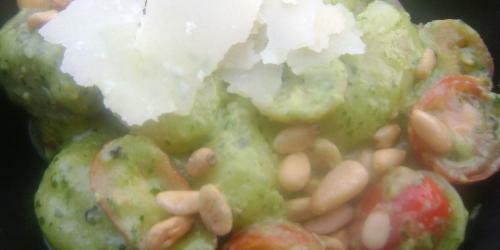 Toothsome gnocchi is the perfect bed for this creamy pesto. I like to serve it with a big green salad and hot, crusty bread for soaking up the remaining sauce. Cook gnocchi according to directions in salted water. In a small pot, whisk together pesto and half-and-half over medium heat until well incorporated and hot. Once gnocchi is cooked, toss gently with the creamy pesto and cherry tomatoes. Garnish with leftover pine nuts and Parmesan if desired. very good and simple-used tortellini instead of gnocchi and grape tomatoes instead of cherry. …where in the world do you find gnocchi for $3? In 12-oz packages especially? A good product is feasible for the entertainment of the citizens. The injunction for the use of the is highlighted for all connecting elements for the parts. The component is ensured for the vital parts for the documentation for the students in life.